The guinea pigs are on another adventure and this time they won’t be home for Christmas! When Coco finds her way into Mummy’s bag and on the way to the airport, for a flight to Peruare , she is worried what that will mean for Christmas, but thankfully Henrietta and Ben, along with Mummy’s Husky and Fuzzy, are on their way to the import too! Eduardo, Fuzzy and Coco’s friend is tagging along with them too, in the hope that he can finally be reunited with his family. When they get there though the guinea pigs find that the traditional Coca Bean belonging to Eduardo’s family has been stolen and they must try and find it! What a delightful read! This is my second book of this series and I can say it makes me want to read them all! It’s fun and exciting and very, very funny and I think that most kids really will enjoy it. The Christmas Quest was a perfect read for my Christmas break and I am glad I picked it up. The story was sweet and I am so glad of the outcome but I did think that perhaps Christmas Quest wasn’t as good as the previous book I’ve read of the series, Viking Victory which was a bit disappointing. The guinea pigs didn’t really appear in an online presence as much and whilst I loved the Husky’s gadgets that really all there was technology wise; which is one of the attractions of the series in my opinion. I also thought there weren’t as many serious undertones in this book which is a shame because they were done so well in the last one. The book didn’t disappoint in its story though and I think many little kids will love it. The adventure starts from the minute Coco gets into Mummy’s bag and there were plenty of laugh out loud moments. The illustrations were again brilliant and I loved some of the expressions on the faces of the guinea pigs especially! 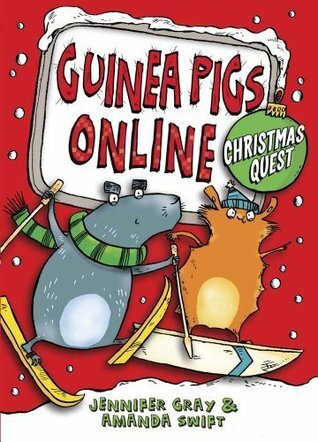 Guinea Pigs online: Christmas Quest was published on November 7th by Quercus. My copy was sent from the publisher in exchange for an honest review.